When it comes to dental problems, most patients receive treatments as needed. However, in extreme cases, a patient may need a full mouth reconstruction procedure. Full mouth reconstruction is a very meticulous process, and it involves a number of different dental procedures. Most full mouth reconstructions entail the use of dental implants and bridges to restore the aesthetics of the smile and the full use of your bite and chewing functions. Full mouth reconstruction is typically recommended in cases where there are several missing or broken teeth, and the bite is severely misaligned. This causes problems with chewing, smiling and even talking, and if not treated, it will lead to gum disease and the forming of abscesses. Full mouth reconstruction is not a unique, standard procedure, but rather a number of different procedures done in succession. It begins with the dentist taking a full set of mouth x-rays. The x-rays enable the dentist to see exactly the bone and tooth structure in the mouth, and if there are problems that need special attention. The dentist makes a bite analysis and a set of digital photographs. Together with the x-rays, he or she can understand how the mouth will look when the procedure is complete. Sometimes the dentist uses the x-rays and analysis with a computer to form a 3-D simulation. Sadly, sometimes the best option is to remove natural teeth that can’t be saved anymore, in one session, or during several sessions. The dentist administers an anaesthetic across all areas of the mouth and extracts all the teeth that can’t be saved. 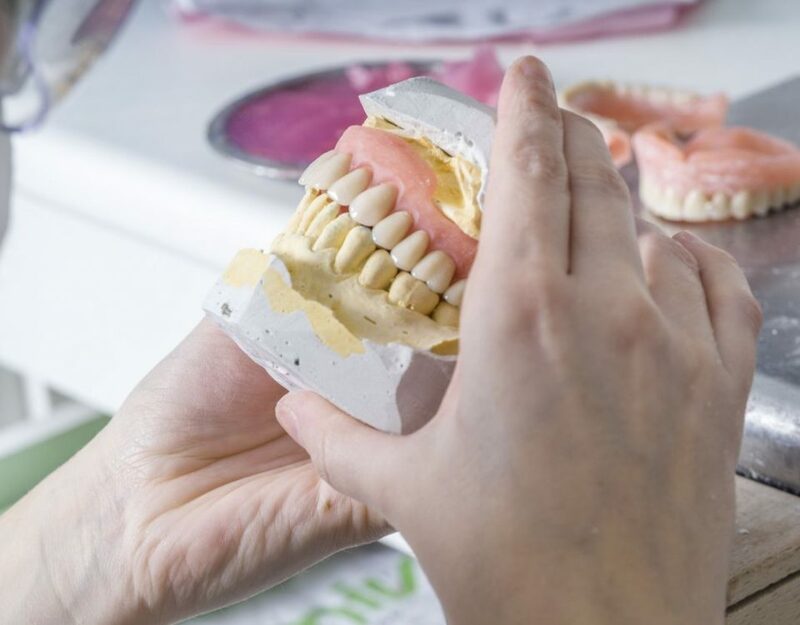 The dentist fabricates a model for a denture or a set of dentures that the patient wears during the course of the procedure. Depending on the amount of work needed, a full mouth reconstruction can take from 6 months to one year to complete. Following the extractions, the gums and jawbones need to heal before the dentist inserts the necessary fittings for the implants and bridges that will function as the new teeth. Because of the scope of the procedure, the requirements for full mouth reconstruction are strict. Before a full mouth construction can take place, patients must cease smoking and excessive sugar consumption. During the procedure, as with any dental work, the patient must pay attention to dental hygiene. The patient should also refrain from eating any hard foods or drinking anything too hot, too cold or too sugary immediately after each procedure. As soon as the full mouth reconstruction is completed, a patient may return to normal practices providing they take care not to break or damage any of the implants or bridges. Again, full dental hygiene is important, as are regular visits to the dentist to check up on the work. Most American dentists are able to carry out full mouth reconstruction, provided they have sufficient experience with every part of the procedure. Since full mouth reconstruction is not a standard procedure, it’s extremely difficult to estimate an average price. The cost of the entire procedure varies from anywhere between $18,000 and $60,000. In some cities or in extreme cases, the price can be even greater. For many people, the cost of full mouth reconstruction is prohibitively high. However, Costa Rica Dental Team is able to offer more affordable, high quality options that make this valuable set of procedures available to many in desperate need of dental care. If full mouth reconstruction has been recommended for you, we invite you to contact Costa Rica Dental Team to get a second opinion and costs. Our English-speaking staff and highly experienced dentists have the latest cutting edge equipment and have performed thousands of full mouth restorations. Give us a call. We’re ready to help you today.